Introduction: In this article, we report the results of our investigation on comparison of radiobiological aspects of treatment plans with linear accelerator-based intensity-modulated radiation therapy and volumetric-modulated arc therapy for patients having hippocampal avoidance whole-brain radiation therapy. Materials and Methods: In this retrospective study using the dose-volume histogram, we calculated and compared biophysical indices of equivalent uniform dose, tumor control probability, and normal tissue complication probability (NTCP) for 15 whole-brain radiotherapy patients. Results and Discussions: Dose-response models for tumors and critical structures were separated into two groups: mechanistic and empirical. Mechanistic models formulate mathematically with describable relationships while empirical models fit data through empirical observations to appropriately determine parameters giving results agreeable to those given by mechanistic models. Conclusions: Techniques applied in this manuscript could be applied to any other organs or types of cancer to evaluate treatment plans based on radiobiological modeling. Brain metastases are the most common intracranial tumors in adults and occur in 10%–30% of cancer patients. One of the treatment options for patients with multiple brain metastases is whole-brain radiation therapy (WBRT) which can be combined with radiosensitizers such as motexafin gadolinium, efaproxiral, and temozolomide. Neurological decline may occur in a patient with WBRT treatment causing cerebral edema in the patient within the first few weeks of treatment, symptoms of which include headaches, somnolence, vomiting, nausea, and inability to focus. One to six months after WBRT, subacute encephalopathy may occur, which increases patient headaches, somnolence, and fatigue. Six months after WBRT, patients may experience severe dementia and memory loss. Irradiating hippocampi is thought to be a factor in WBRT-associated cognitive decline because the hippocampi are essential in learning, retrieval of information, and the formation of new memories. One of the ways to reduce cognitive decline is to avoid irradiating the hippocampus when performing WBRT in a process called hippocampal-avoidance WBRT (HA-WBRT). It is possible to create WBRT treatment plans that spare hippocampi with equivalent dose distributions to conventional WBRT treatment plans. The most common delivery techniques for HA-WBRT are intensity-modulated radiation therapy (IMRT) and volumetric-modulated arc therapy (VMAT). VMAT is a subset of IMRT where radiation is delivered in an arc instead of at static angles. The most common biological metrics used to guide clinical predictions are tumor control probability (TCP) and normal tissue complication probability (NTCP). TCP is the probability of localized tumor control for a given dose distribution, while NTCP is the probability of an undesirable effect from an organ due to radiation. A challenge of radiation therapy is to find a balance of these values to give each patient the optimal treatment by raising TCP as high as possible, while lowering NTCPs as low as possible. Dose-response models for tumors and critical structures are separated into two groups: mechanistic and empirical. Mechanistic models formulate mathematically with describable relationships while empirical models fit data through empirical observations. We may not be able to accurately formulate some biological processes because of their complexity to make mechanistic models, but this is not a challenge for empirical models which simply need to fit data. Dose-volume histogram (DVH) shows how much dose is being received by a structure. It can be used to view physical parameters such as minimum, mean, and maximum dose to calculate TCP and NTCP. Because of limited information in the setting of HA-WBRT, the purpose of our study was to calculate and compare target doses, normal tissue doses, TCP, and NTCP values for treatment plans utilizing IMRT- or VMAT-based on HA-WBRT. Treatment planning for 15 patients was carried out with Varian Eclipse treatment planning system using 3-arc VMAT (Rapid Arc) and 9-field step-and-shoot (S and S) IMRT, both calculated with Anisotropic Analytical Algorithm. From this point in our manuscript, whenever we refer to IMRT, we are referring to S and S IMRT. The planning target volume (PTV) was defined as the whole-brain excluding a uniform three-dimensional 5-mm expansion around the hippocampus. Prescribed doses in all plans were 30 Gy delivered over 10 fractions normalized to a minimum of 95% of the target volume receiving 100% of the prescribed dose. Simultaneous integrated boost or stereotactic boost was not utilized for any of the treatment plans. The radiation therapy oncology group (RTOG) trial 0933 study criteria  were followed for contouring and dose-volume constraints. Bilateral hippocampal contours were made on imaging datasets consisting of thin-slice spoiled gradient echo (SPGR) magnetic resonance imaging sequences fused to a treatment planning computed tomography (CT) scan. The PTV was defined as the whole-brain parenchyma excluding the bilateral hippocampal contours plus a 5-mm margin. The variation acceptable criteria for the protocol were used. In brief, these included PTV D2% ≤40 Gy and D98% ≥25 Gy. The hippocampal constraints included a D100% ≤10 Gy and a maximum hippocampal dose of ≤17 Gy. All treatment plans used identical contour sets and a single radiation oncologist reviewed and evaluated all treatment plans. Calculations of statistical significance were performed using Student's paired t-test to compare VMAT and IMRT plans. Treatment plans were evaluated based on tumor dose fall off, amount of dose received by normal brain tissue, and critical structures as well as the radiobiological comparison which was the purpose of this manuscript. This study was reviewed by our institutional IRB before initiation. In this formulation, Nf is the number of fractions in the treatment, Dref is the reference dose of 2 Gy, the α/β is the ratio of two radio-sensitivity parameters found in the linear quadratic model explaining the linear and quadratic parts of cell killing, SF2 is the clonogenic cell survival fraction at a dose of 2 Gy, Di is the dose being received by each partial volume segment, and vi and pi are, respectively, the local volumes and densities of clonogens. We calculated EUDs for the IMRT and VMAT treatment plans using the formula shown in equation 1. When calculating the EUDs, we varied the values of SF2 as 0.4, 0.5, and 0.6 while varying the values of the α/β ratio to 2, 6, and 10 for each value of SF2 to determine appropriate model parameters for the future studies. Our value for Nf was 10 and the value for Dref was 2 Gy. The DVH was divided into 10 partial volume segments each covering 10% of the structure volume. Di was taken to be an average of the doses being received by the highest and lowest partial volumes. For example, when calculating the dose for the partial volume segment which spans 80% to 90% of the structure volume, we took Di to be the average of the dose covering 80% of the structure volume and the dose covering 90% of the structure volume. where vi is the fractional volume irradiated to a dose Di, and “a” is a unitless tissue-specific parameter that describes the dose-volume effect. As the value of “a” becomes a large negative number, the gEUD leans toward the minimum dose received by the tissue. When “a = 1,” the gEUD is equal to the average dose. As the value of “a” becomes a large positive number, the value of the gEUD leans toward the maximum dose. For tissues which experience serial organ complication, the value of “a” should be a large positive number, for tissues that experience parallel organ complication, the value of “a” should be around 1, and for tumors, the value of “a” should be a large negative number. We also calculated gEUDs using formula shown in equation 2. Di's were reused from our previous EUD calculation. Because the DVH was divided into 10 equal segments, vi was kept constant at 0.10. While calculating gEUDs for PTV, we varied our fitting parameter “a” to integers from −1 to −16. For calculating gEUDs for normal tissues, we used fitting parameter “a” equals +7. where N is the number of clonogenic tumor cells (assumed in this study to be 4000, 40000, 400000, and 800000), D is EUD, Nf, Dref, SF2, and α/β are terms explained before. Radiation therapy is traditionally given in many fractions. This is because delivering the dose over time allows killing of maximum clonogenic tumor cells while having the least toxic effect on normal tissues. We calculated TCPs for each combination of N, SF2, and α/β ratio using the formula shown in equation 3. Another common way to calculate TCP is with the following empirical formula  shown in equation 4.
where TCD50 is the dose to control the tumor 50% of the time when the tumor is irradiated homogenously, gEUD is the gEUD calculated with formula shown in equation 2, and is a unitless fitting parameter that determines the slope of the dose-response curve. We also calculated values of TCP using the formula shown in equation 4. We varied the value of parameter “a” in equation 2 from -1 to -16 to get values of gEUD. We used a TCD50 value  of 22.17 Gy and varied γ50 to determine value of TCP that agreed the best with our mechanistic model prediction. The NTCP is a quantitative measurement of the probability a dose of radiation will have an undesirable effect on an organ. The following mechanistic formula  is used to calculate the NTCP as shown in equation 5.
ϑ is the fraction of the organ irradiated, Vref is the reference volume for TD50, TD50 is the tolerance dose to the reference volume which would lead to a 50% complication probability, n is a parameter which determines the volume dependence of the complication probability, and m is a parameter which determines the slope of the complication probability versus the dose curve. Dose-response models are commonly based on linear-quadratic model of cell killing which has two adjustable parameters: α (linear component of cell killing) and β (the quadratic component of cell killing). The α/β ratio is the dose at which the linear and quadratic components of cell killing have equal contributions. The isoeffective dose is a method to account for the effect of fractionations in radiation therapy treatment that takes into account the behavior of early and late-responding tissues. This is calculated with the following formula  shown in equation 6 relative to a standard 2 Gy per fractionation scheme usually used in conventional fractionated radiation therapy. where Df (=3 Gy) has been the fractionated dose used in the present treatment. 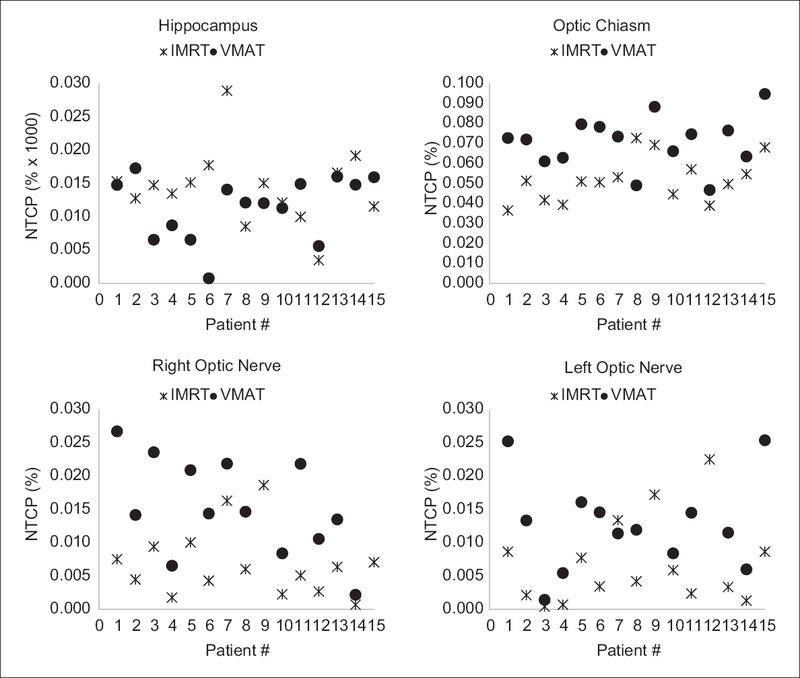 We compared the tissue-sparing capabilities of IMRT and VMAT by calculating the NTCPs for various tissues that included among others hippocampus, optical structures, etc., from each of the corresponding treatment plans. We calculated NTCPs using the formula shown in equation 5. Microsoft Excel's normal distribution function was used to calculate NTCPs once t-values were calculated with the formula shown in equation 5. Conventional fractionated radiation therapy usually uses doses of approximately 2 Gy/fraction and so typical value of the parameters TD50 used to calculate t-values are available in the literature  for 2 Gy/fraction schemes. However, we used 3 Gy/fraction for treatment in the present study. Using the isoeffective dose value of 1.25 as shown in equation 6, TD50 values  of brain (since the TD50 value of hippocampus is not known) and optical structures of 60 and 65 are modified and values of the parameters TD50, m, and n used to calculate t-values are given in [Table 1]. Another common method of calculating the NTCP for various tissues is through the following empirical formula  shown in equation 7.
where TD50 is the tolerance dose that gives a 50% complication rate, gEUD, and γ50 are parameters previously explained. We also calculated NTCPs using the above formula. Modified TD50 values shown in [Table 1] were used along with a constant γ50 value of 3. Secondary to limitations on the availability of hippocampus-specific parameter estimates, the same calculation end point of necrosis that was used for the brain and optic structures were also used for the hippocampus. All VMAT and IMRT treatment plans met the RTOG trial 0933 criteria. The average EUDs calculated using equation 1 with SF2 of 0.4, 0.5, and 0.6 and α/β ratios of 2, 6, and 10 for IMRT and VMAT treatment plans ranged from 25.74–29.11 Gy for IMRT to 25.27–28.58 Gy for VMAT treatment plans. In all cases, the average EUD for IMRT was greater than that of VMAT by about 2% (P ≤ 0.02) as shown in [Figure 1]. 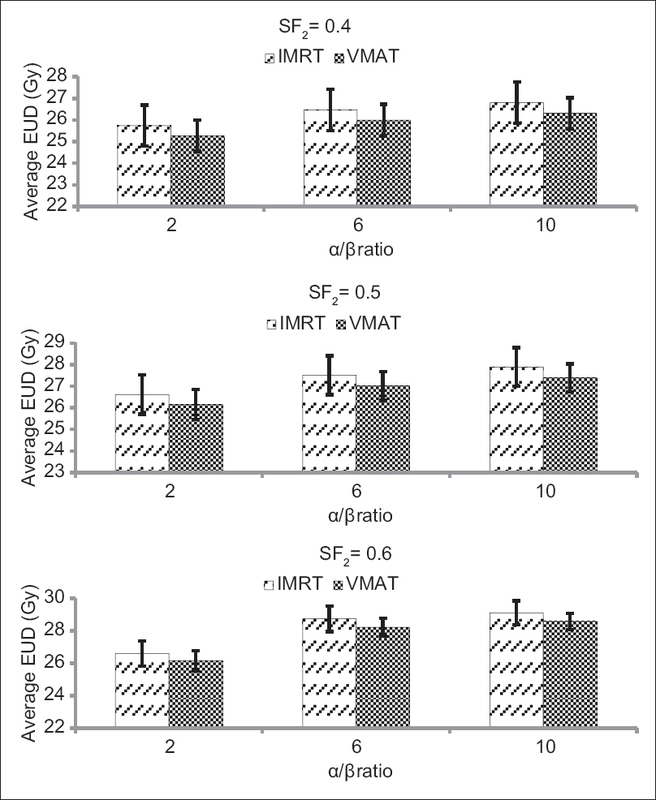 In general, the average EUD increased with the α/β ratio and the SF2 for both IMRT and VMAT. 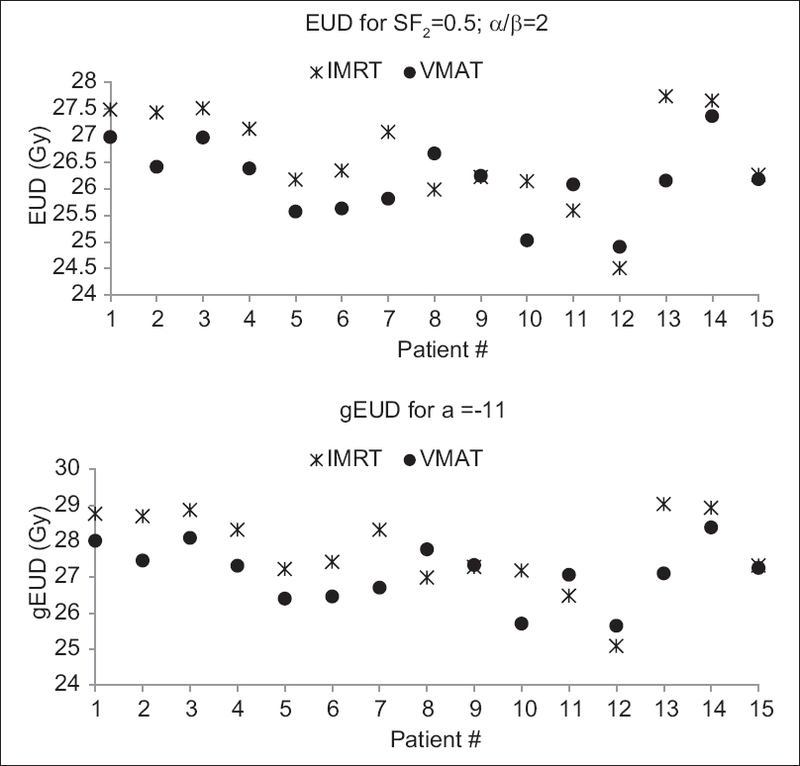 Examples of typical EUD (with SF2= 0.5 and α/β = 2) and gEUD (with a = −11) for the PTV for each patient are shown in [Figure 2]. The average EUD and gEUD for IMRT was again greater by 2% compared to that for VMAT. Furthermore, we found that the calculated gEUDs of the PTV using equation 2 decreased when the fitting parameter, “a,” decreased and the average gEUD was 2% higher in IMRT treatment plans than that of VMAT treatment plans when −16≤ a ≤ −2, and 3% when “a” = −1. In all cases, the difference between average IMRT and VMAT gEUDs were statistically significant (P ≤ 0.02). 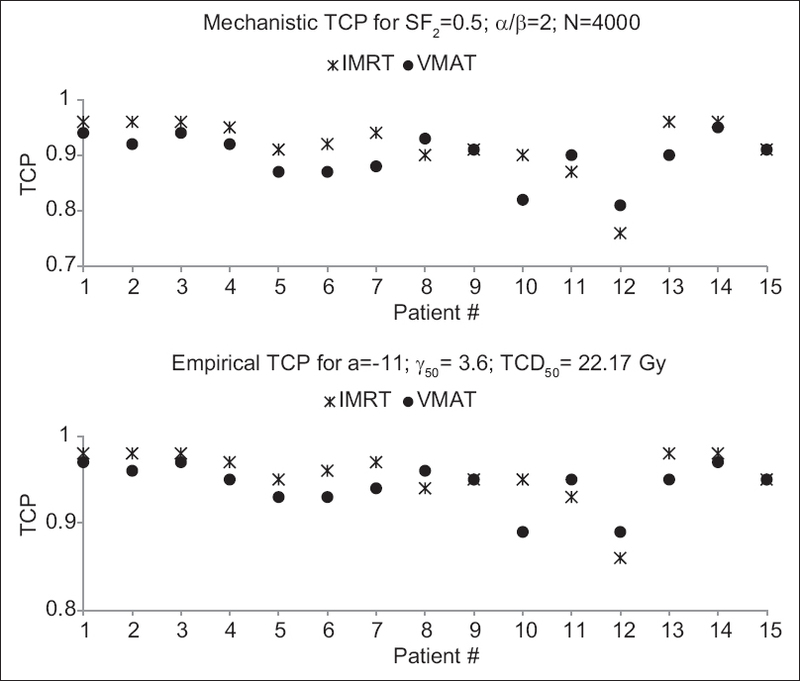 The TCPs for both IMRT and VMAT treatment plans were calculated using equation 3 with various SF2, α/β, and estimated clonogenic cell counts. [Figure 3] shows results of a typical TCP calculation with SF2 of 0.5, α/β ratio of 2, and clonogenic cell counts estimated with CCD of 500 using formula 4. The ratio of average IMRT TCPs to average VMAT TCPs were also found to increase with the increase of SF2, α/β ratio, and CCD values. We varied the value of γ50 in equation 4 and found that the TCP values were most agreeable with results obtained using the formula in equation 3 when γ50= 3.6. Using equation 4, it was also found that the ratio of average IMRT TCPs over average VMAT TCPs varied from 1.00 to 1.03, as we varied the parameter “a” from −1 to −16. [Figure 3] also shows a typical TCP calculation with “a” equals-11, γ50= 3.6 and TCD50= 22.17. Our results show that on the basis of TCP calculations, IMRT performed 2% better than VMAT using equation 3, and 1% better using equation 4; which again indicated better tumor control in favor of IMRT. With the mechanistic formula shown in equation 5, NTCPs were calculated for hippocampus, optic chiasm, right optic nerves, and left optic nerves. Specifically, IMRT lowered the NTCP of optic chiasm by a factor of two, right and left optic nerves by a factor of twenty-five but raised the NTCP of hippocampus by a factor of thirty. [Figure 4] contains the average gEUDs of critical structures for IMRT and VMAT treatment plans calculated with the formula shown in equation 2. The hippocampus in IMRT treatment plans had a higher gEUD than that of VMAT treatment plans (P = 0.19); however, the opposite was true for all the three optical structures (P < 0.01) which supports the previous trend obtained using the mechanistic formula. The average NTCPs calculated from gEUDs using equation 7 were greater for IMRT compared to VMAT for the hippocampus by about 27% (P = 0.13). The opposite was true for the optical structures, where the NTCPs calculated were lower for IMRT compared to VMAT by about 27% for optic chiasm, 62% for right optic nerve and 56% for left optic nerve (P < 0.01). The NTCP values per patient are shown in [Figure 5]. [Figure 6] gives representative examples of dose shown in color-wash superimposed on an axial slice from the treatment planning CT set for both IMRT and VMAT. In this manuscript, we estimate TCP, NTCP, and EUD values for IMRT- and VMAT-based treatment planning for hippocampal sparring WBRT. Our analysis suggests that both of these treatment approaches have their advantages. On the basis of TCP calculations, IMRT performed 2% better than VMAT using equation 3 and 1% better using equation 4. Both of these results indicate improved TCP in favor of IMRT-based treatments. 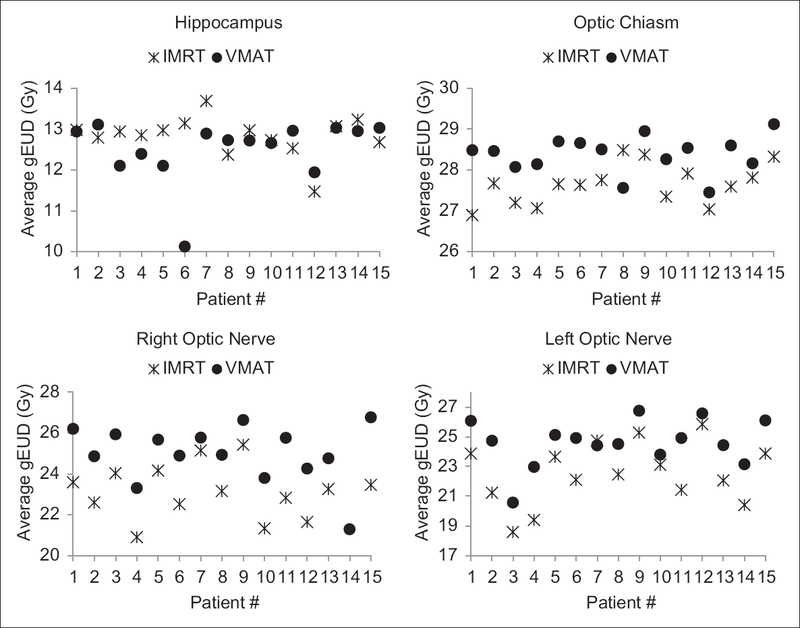 Similarly, IMRT-based treatment plans resulted in lower NTCP values for the optic chiasm and optic nerves while higher NTCP parameters were obtained for the hippocampus. These results are consistent with reports suggesting VMAT may be better at sparing the hippocampus while meeting the treatment goals for the PTV., Even though the relative difference in NTCP was large, the values for the NTCP's were so small that any rational statement based on this comparison is difficult to make. In this manuscript, the parameters for empirical TCP and NTCP models were derived by fitting our data to mechanistic models. Values for our mechanistic models were taken from values in literature derived from clinical outcomes and tuned to derive optimal results. While these fitting parameters are not the most optimal, we feel they are appropriate for use. TCP calculations have been utilized for the treatment of brain tumors, both in the setting of stereotactic radiation therapy as well as with standard fractionation radiation therapy.,, The parameters used in our model are consistent with what has been used in these reports. However, there is little information specific to the setting of HA-WBRT with IMRT or VMAT, where the overall dose distribution is more heterogeneous, and our results represent best estimates for this setting. In particular, little information specific to the hippocampus is available. For our NTCP calculations, we used similar parameters for the brain and the hippocampus, while the potential toxicity, as well as the dose at which the toxicity occurs, is very different, both clinically and mechanistically. The toxicity of interest for the hippocampus is the development of neurocognitive function decline which is likely to occur at lower doses than what would be expected for brain necrosis and further studies are necessary to establish TD5/5 and TD50/5 estimates that are specific for the hippocampus. HA-WBRT is an effective treatment to the brain with its goal being to provide adequate coverage of the brain parenchyma while reducing the radiation doses to the hippocampus. The linac-based IMRT or VMAT are potential techniques to reduce doses to the hippocampus while treating the brain parenchyma. We found that IMRT treatment plans had a higher TCP than VMAT treatment plans and also had a lower NTCP for the optical structures. For the hippocampus, when the end point for the calculation was necrosis, IMRT plans had higher NTCP values when compared to VMAT treatment plans. In this study, we have also found appropriate fitting parameters that can be used in empirical models for EUD, TCP, and NTCP. The concept of isoeffective dose to estimate TD50 for hippocampus and optical structures with 3 Gy per fraction used in this study could be applied to any radiation therapy study for other organs and cancers utilizing different fractionation scheme. Khuntia D, Brown P, Li J, Mehta MP. 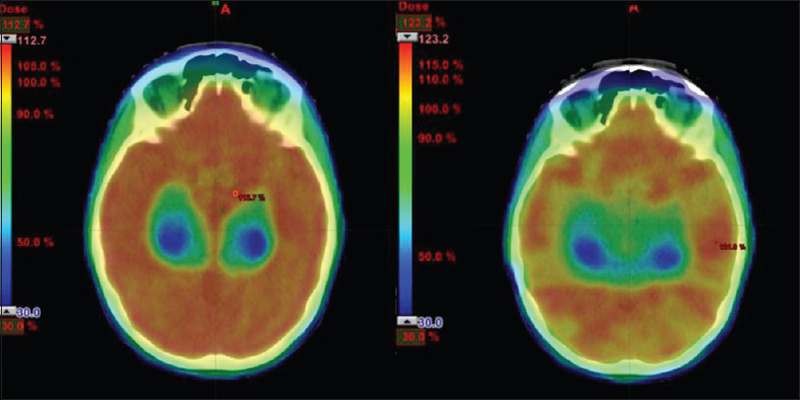 Whole-brain radiotherapy in the management of brain metastasis. J Clin Oncol 2006;24:1295-304. Marsh JC, Gielda BT, Herskovic AM, Abrams RA. Cognitive sparing during the administration of whole brain radiotherapy and prophylactic cranial irradiation: Current concepts and approaches. J Oncol 2010;2010:198208. Allen Li X, Alber M, Deasy JO, Jackson A, Ken Jee KW, Marks LB, et al. The use and QA of biologically related models for treatment planning: Short report of the TG-166 of the therapy physics committee of the AAPM. Med Phys 2012;39:1386-409. Gondi V, Pugh SL, Tome WA, Caine C, Corn B, Kanner A, et al. Preservation of memory with conformal avoidance of the hippocampal neural stem-cell compartment during whole-brain radiotherapy for brain metastases (RTOG 0933): A phase II multi-institutional trial. J Clin Oncol 2014;32:3810-6. Niemierko A. A generalized concept of equivalent uniform dose (EUD). Med Phys 1999;26:1101. Ahmad S, Vogds BJ, McKenna F, Vlachaki MT. Tumor control probability (TCP) in prostate cancer: Role of radiobiological parameters and radiation dose escalation. J Xray Sci Technol 2009;17:347-54. Hall EJ, Giaccia AJ. Radiobiology for the Radiologist. Hagerstone, MD: Lippincott Williams & Wilkins; 2012. Metcalfe P, Kron T, Hoban P. The Physics of Radiotherapy X-rays and Electrons. Madison, WI: Medical Physics Publishing Corporation; 2007. p. 450. MacDonald SM, Ahmad S, Kachris S, Vogds BJ, DeRouen M, Gittleman AE, et al. Intensity modulated radiation therapy versus three-dimensional conformal radiation therapy for the treatment of high grade glioma: A dosimetric comparison. J Appl Clin Med Phys 2007;8:47-60. Clemente-Gutiérrez F, Pérez-Vara C, Clavo-Herranz MH, López-Carrizosa C, Pérez-Regadera J, Ibáñez-Villoslada C, et al. Assessment of radiobiological metrics applied to patient-specific QA process of VMAT prostate treatments. J Appl Clin Med Phys 2016;17:341-67. Wang BH, Hua W, Gu X, Wang XL, Li J, Liu LQ, et al. Dosimetric study of different radiotherapy planning approaches for hippocampal avoidance whole-brain radiation therapy (HA-WBRT) based on fused CT and MRI imaging. Australas Phys Eng Sci Med 2015;38:767-75. Rong Y, Evans J, Xu-Welliver M, Pickett C, Jia G, Chen Q, et al. Dosimetric evaluation of intensity-modulated radiotherapy, volumetric modulated arc therapy, and helical tomotherapy for hippocampal-avoidance whole brain radiotherapy. PLoS One 2015;10:e0126222. Pedicini P, Fiorentino A, Simeon V, Tini P, Chiumento C, Pirtoli L, et al. Clinical radiobiology of glioblastoma multiforme: Estimation of tumor control probability from various radiotherapy fractionation schemes. Strahlenther Onkol 2014;190:925-32. Toma-Dasu I, Sandström H, Barsoum P, Dasu A. To fractionate or not to fractionate? That is the question for the radiosurgery of hypoxic tumors. J Neurosurg 2014;121Suppl:110-5. Shuryak I, Carlson DJ, Brown JM, Brenner DJ. High-dose and fractionation effects in stereotactic radiation therapy: Analysis of tumor control data from 2965 patients. Radiother Oncol 2015;115:327-34.